A water softener is a self contained unit which is attached to the water supply of a building to ‘soften’ the water as it passes through the unit. Water softeners can be installed in domestic and commercial buildings and are especially beneficial in hard water areas. Water softeners are available in a range of sizes to suit your requirements (building/family size, hardness of water etc). Our trained service engineers ca install the water softener is a convenient position for ease of maintenance. 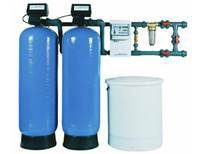 The water softener removes calcium, magnesium and certain other metal cations in hard water. The resulting ‘soft’ water is more compatible with soap, will not form scale on surfaces like tiles and taps and extends the efficiency and lifetime of plumbing and appliances. A water softener works by passing incoming hard water through a sealed container (called a resin vessel) which contains thousands of little ion exchange resin beads. These beads attract and retain ‘hardness’ in the water i.e. scale and scum meaning it does not enter the water supply within the building. When the beads become saturated with hardness they need cleaning and regenerating for continued use. This cleaning process is carried out automatically within the water softener by rinsing the beads with a weak solution of brine (salt and water). The waste brine and hardness is then automatically flushed away. To keep your water softener functioning at its best all you have to do is ensure the softener is kept full of salt. Water softener models use tablet salt. It is important to note that salt does not soften the water. The resin cleans/softens the water and when required the salt cleans the resin. During the cleaning of the resin, the waste salt, scale and scum is discharged automatically down the drain. At no time does the salt enter the water supply.